Now I love this site and read it all the time. But what you are about to read is what has and is still happening to me. This happened to me 5 years ago when I was about 11 years old, living in Fairbanks, Alaska. My family would always rent houses at Birchwood homes, a decent place to live outside of the army base my dad worked at. Now being the kids we were back then we would always try talking to ghost to get them to scare us, but nothing ever happened at "the moment we were trying them." Now don't get me wrong we weren't being mean or smarty about it, just trying to have to fun. One day after school at about 4 my mom wanted me to put something up in her room. Now I never liked going upstairs by myself, actually I never liked going anywhere by myself. I would feel like someone was watching me. So I ran up the stairs to try and get it over with as quickly as possible. But as I turned the corner to my mom's room, this shadow like figure was just standing there the at the door. Now I was totally freaked out! I was so scared I couldn't even move! It was all black with no face, just a hood like thing, and it was kind of hunched over like when you try to get a dog to come to you. Now being the expert I was with ghost, I turned right around and basically jumped the stairs. With my mom being highly religious at the time, I didn't want to scare her, but she was wondering why I was so scared. So I told her that I had just seen an angel in her room, which see was really happy about. But I knew the truth, what I had seen was no angel. That night I drew what I saw in my diary, and only showed it to my sister, for we would always keep secrets for each other. Since then more things have happened that I can't wait to share, and boy do they get creepier. But this one is where it all really started. The following comments are submitted by users of this site and are not official positions by yourghoststories.com. Please read our guidelines and the previous posts before posting. The author, GenjiGod, has the following expectation about your feedback: I will read the comments and participate in the discussion. I think the OP was being sarcastic when he called himself an "expert" 😆. Takes one to know one haha But if you read it in a sarcastic tone it makes much more sense. Ok, if you were a ghost expert at the time wouldn't You still be one now and wouldn't you know if it was bad or evil? Second, Why not just tell your mom what You saw maybe she can help You with how best to deal with it? Lastly dealing with the paranormal is not a game and not everything dark and shadowy is bad. Hopefully You can figure this one out and there is no negative repercussions from it. Personally, I find it hard to believe your mother's inability at reading your fear and believing that you had seen an angel. Hey, I agree with rookdygin again, I did a research and I found information about native people around, yup, as said Native Alaskan looks just as you have described... A little confusing towards the end though... Can you be specific? Did it startle you, heck yes, were you scared cause you saw something you did not expect, yes again. Does the fact you saw an unexplainable shadow figure make it a negative or evil 'spirit manifestation'. "Now being the expert I was with ghost..."
"This happened to me 5 years ago when I was about 11 years old,..."
I hope you have kept a Journal and I recommend looking into the History of the home/property it sits on. I'll be out on the Fence waiting for more from you. Please ask any questions you may have. From what I believe, I doubt what you saw was something positive, and I don't believe it was an angel. I had a similar experience, except when I saw an angel, it did surprise me, but it did not scare me. Similarly for some reason that angel did not move. I was a little bit younger when I saw it, around six or seven years old. 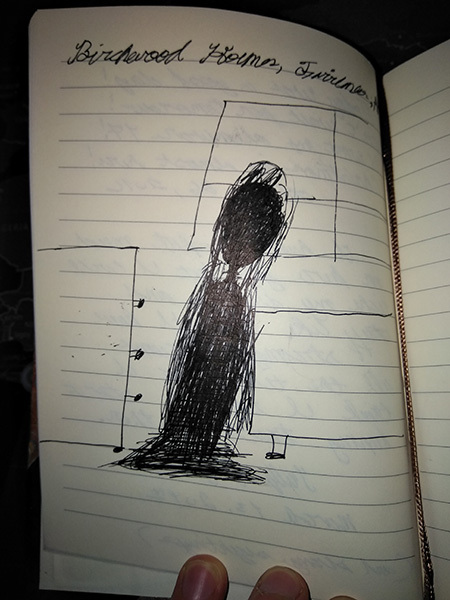 The reason I don't think it was a positive (ghost, apparition, there's nothing specific I would think to call it) is because it didn't make you feel calm and your first instinct was fear where as what I saw made me calm with some surprise. I'd like to hear more about any more details you may have. Maybe what both of us saw are kind of the same thing, but opposite. Let me know if you have any questions for me, I really would like to hear from you. © The ghost story The Hooded Angel is copyrighted to GenjiGod. Edited by yourghoststories.com.